Drop a quick hello and hope you had a wonderful weekend! 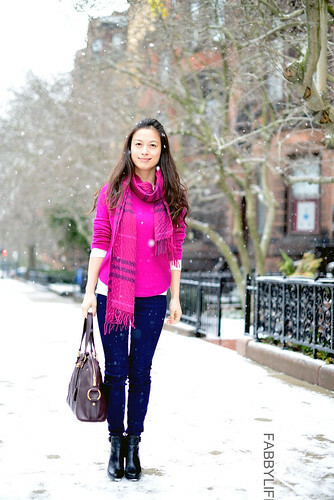 Bright vibrant colors in a snowy day, I love! What a beautiful color combo in winter! You always look fabulous on fuchsia. Pretty outfit! Is the scarf new buy? The first pic is so refreshing and eye-catching! I myself never can pull off this color, but look how good it is on you especially when it snows. Thank you so much. Unlike Vince v-back cashmere sweater (which is thinner), this boatneck one doesn't generate horrible static electricity.